A Dutch friend once told me that when she visited the United States in autumn our forests “looked like a fairy tale” with the leaves turning to colors of flame. I had never considered what it would look like to someone whose home country doesn’t really have an autumn display like ours, but I think of her description sometimes when I notice the sunlight glittering through the yellow and russet canopy and the sparkling flutter of the leaves as they fall. This year I’ve been letting leaves cover my lawn and porch and even parts of my house before rushing to rake them up – even though I know will be overwhelmed by the twentieth leaf bag or wheelbarrow trip to the compost pile. As I write, I’m listening to the droning blare of perfectionism, obsession and waste. 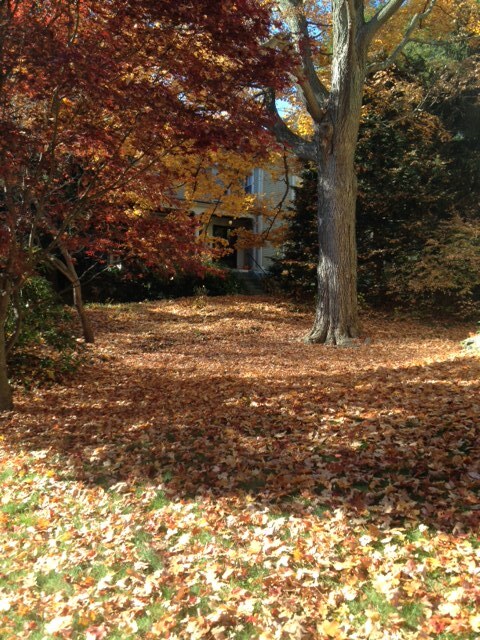 Yes, the leaf blower – easy target of suburban environmental angst — but it makes you wonder why we have to attack autumn as if it were a scourge. The guys across the street, carrying big hoses on their shoulders and shooting the blowers at leaf litter, look like they’re brandishing weapons. It also makes you wonder why we purchase plastic representations of autumn to hang on our doors and adorn our porches, but can’t let the lawn be covered in leaves for a couple of weeks. Leaf blowers seem such a minor convenience we don’t see the bigger disinterest in ending pollution. It turns out everybody kind of mis-under-esti- whoops!imated their emissions: China just looked around and discovered it has put a billion more tons of CO2 into the atmosphere than they thought. Volkswagen just announced it has been inflating the fuel economy of its gasoline cars, too, in addition to installing a device to make its diesel cars seem more efficient than they are. How can any of us make a difference when things are happening at that scale? And what do we have to do with it? We have somehow – in very recent years – connected the need to use gasoline to blow leaves to perfection, the right to pursue that perfection to freedom, and defense of that freedom to menace should anybody ask you to stop. We saw this in our town when a proposal to ban the big gas-powered leaf blowers in the summertime inspired landscaping companies to send brawny men to stand with their arms folded in the doorways and balcony of our Town Hall. Leaf blowers aren’t enough to cause climate change – but the principle behind using them is. Things will change when we want to be outside enjoying the real autumn, instead of inside Target or Home Goods purchasing Chinese approximations of it. When we insist that our cars burn so little fuel we roll down the windows to smell not gasoline but the last warm air before the winter. When we curse the raking of the leaves – or just pay someone to do it — but at the same time notice that our neighborhood looks like a fairy tale.